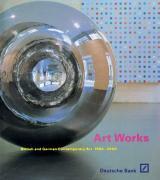 Art Works offers a unique, fully illustrated survey of contemporary British and German art, reproducing mostly unpublished works by Francis Bacon, Joseph Beuys, Damien Hirst and many others. Mary Findlay is curator of Deutsche Bank London's art collection. Alistair Hicks is an editor, curator and author of The School of London (1989) and New British Art in the Saatchi Collection. He is art adviser to Deutsche Bank London. Friedhelm Hütte has been curator of Deutsche Bank's art collection globally since 1986. He is based in Frankfurt. Art Works offers the opportunity to learn about this innovative corporate collection as well as providing a coherent and rounded version of late twentieth-century art"